Performing yoga in a heated room will burn more calories and make you sweat. Hot yoga, also called Bikram yoga, is a style of yoga that is performed in a heated room. Hot yoga participants work out in a room that is usually heated to about 105 degrees Fahrenheit. A session lasts 90 long, sweaty minutes. There are a total of 26 postures that work all of the major muscle groups with strong muscle contractions and long-held poses. You will probably sweat profusely during a 90-minute session of hot yoga. You will weigh less after an extended period of sweating due to water loss, but will regain that weight back as soon as you rehydrate your body. Any physical exercise is better than doing no exercise. When you do hot yoga, your heart rate will increase due in part to the high temperatures, which can help burn some calories. You can burn about 240 calories when you do one hour of ordinary yoga exercises, but according to an article on the Muuyu Yoga website, you can burn between 700 and 1,300 calories during each hot yoga workout. You can burn about 360 calories in one hour of aerobic exercise. The number of calories that Bikram yoga websites claim you can burn during one session seems exaggerated and is not backed by any scientific study. Take some basic precautions before you decide do hot yoga. The most important thing is to drink lots and lots of water. You need to drink at least 16 ounces of water before you begin, and drink water every 15 minutes throughout the session. Drink at least 20 more ounces after your hot yoga workout. Dress in skimpy clothes to allow your skin to sweat and avoid overheating. You might be suffering from heat exhaustion if you feel dizzy, nauseous, weak, tired or feel like you might throw up. Other symptoms of heat exhaustion include headache, confusion and a rapid heart rate. Get out of there if you feel any of these symptoms and lie down in a cool area. Drink water, and call a doctor if your symptoms don't subside. There are 26 hot yoga poses that each provide different benefits for your body. The poses are Hatha yoga poses. You begin by doing poses that stretch your muscles and joints. You start out slow and easy stretching your muscles and breathing. The poses become increasingly more difficult, so if you feel weak or sick from all that heat and sweat, bow out now. If you can make it to the end, you get to relax a bit with some more stretching-type postures. Beginner's hot yoga classes are also available, which are just as hot but with easier poses. Mayo Clinic: What's Different About Hot Yoga Versus Other Types of Yoga? 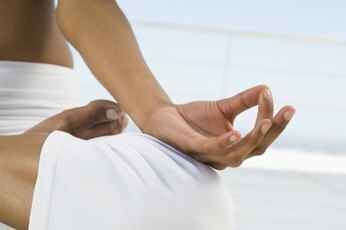 Mayo Clinic: Can Yoga Help Me Lose Weight? What Do You Wear on Your Stomach When You Work Out to Help You Lose Your Stomach? Do Steam Rooms Replace Cardio Workouts?